is one of Ptolemy's original 48 constellations, and only accessible to me via New South Wales astro-imager friend Brett Soames who acquired our data 'down under'. Swaths of cosmic dust sprawl across a rich Milky Way star field near the crown's northern border. 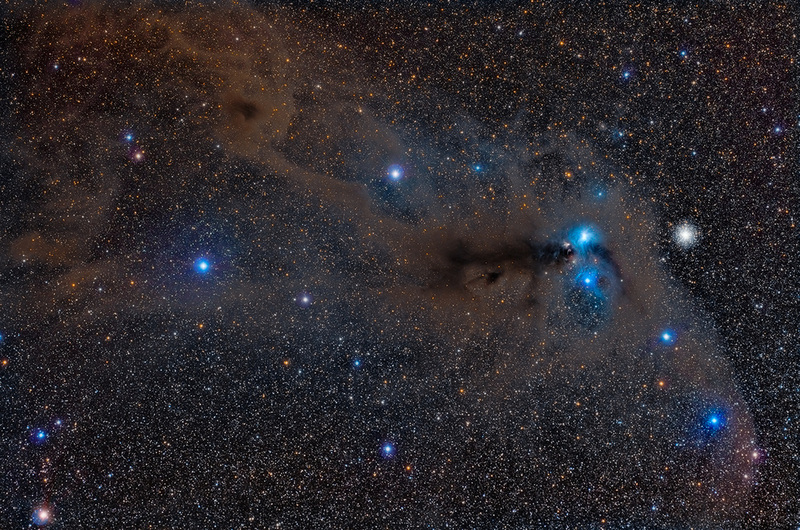 Right of center is the focal point- a gorgeous grouping of blue reflection nebulae- NGC 6726, 6727, 6729, and IC 4812. Magnificent globular star cluster NGC 6723 is at 3 o'clock. Though it appears to be part of the group, its ancient stars lie nearly 30,000 light-years away, as compared with the nebulosity, which is less than 500 light-years from Earth. Here is a high-resolution close-up of the reflection nebulae at right.